Albums I'm listening to and eventually reviewing this week. Breakfast today was provided by Trent. Good job Trent. It has been a long time since we have all caught up with Troy and Janet, but we did this afternoon. Having gathered up the kids from Helen's parents, who had looked after them for us when we went to Mark's 40th birthday last night, we headed for Wollongong Harbour and Belmore Basin for a late lunch. Having had fish and chips (though Josh went for the plain hamburger, which I must say was bloody good) we sat around and talked while the kids went down to the sand and water to play. It was a spectacular day. Tonight Helen and I headed off to Mark Yates' 40th birthday party, held at his and Melissa's home in Primbee. Fortunately for all, the gale force weterlies that have been blowing for most of the week had dissapated, leaving a still but chilly August evening for the party. As the designated driver (and in this day and age, when aren't I?) I spent the evening watching those around me having a very pleasant time along with numerous alcoholic beverages, while I had my two cans, and participated in the toughest cricket ever played. Yes, it's tough cricket. Jack Yates was waiting for me as I walked through the gate. He thrust the bat into my hands, and it was on from 6.30pm. While I was not the only participant, and was not forced to be a constant ingredient, the game (and Jack) was still going when we left at 12.50am. Crazy stuff, or obsessive? Certainly obsessive. There was basically no break, with many of the guests being roped in during the evening. I can only hope that, before the next event at the Yates household, that they have installed better floodlighting and invested in a white ball, rather than the green ball and then the red ball that was in use that evening, and preferably a ball with a bit of bounce, and not one that runs along the ground. The cricket scene just before midnight. Today was the in-laws, Chris and Chris, 45th wedding anniversary. Given that they also have their birthdays over the coming few days as well - Christine's being August 27th and Chris' being September 4th - the family held a party at their house to celebrate all three events. We had about a 50% success rate, with Linda and her family not able to make the journey down from Brisbane, Phil and his family all falling sick to the dreaded lurgy and sensibly calling off their trip, and Joel only bringing himself down from Killara. Helen spent much of yesterday afternoon cooking the various cakes and slices for the event, making cupcakes for the birthdays, as well as her Golden Slice and Maria's chocolate brownie recipe. Good job Helen, one of your best. I has spent a good portion of yesterday evening, and then some more of this morning, in preparing the meal for the day. This consisted of chicken wings for starters, some plain herbed wings for the kids and some chilli, ginger and lime wings for the adults, from a recipe Dad had lent me. Then there was Malaysian Chicken Curry Noodle Soup for next course (and I made sure it had a fair bite to it on this occasion). This was followed by beef mussaman curry and rice, with fried rice for the kids. I enjoy cooking, but sometimes it's the time consumption that can be a bit tiresome. It's all worth it in the long run, especially if I've done it right, which I think I had on this occasion. So all in all, a good afternoon was had by all, and the birthday oldies got to blow out their candles as well. Jessie's Under 11 Albion Park team lost their B division semi-final today 2-1 in a disappointing way to end their season. They led 1-0 at half time and looked the better team, but as has been the way this season they visibly tired in the second half, and along with what I thought were a couple of tough non-decisions by the umpires, were found out and beaten by the Fairy Meadow team. I could have been biased, but certainly in the last five minutes when our team constantly attacked, I felt there were a number of times that, at the very least our team should have been awarded a short corner. However, in all cases they were denied. Still - as an expert in semi-final / final / grand final losses, I can assure Jess that enjoying the game is the most important thing, because actual victories in finals can be very difficult to achieve. Mackenzie Glen has been cooking again! Good job Kenz! Today was the Book Week Parade at Albion Park, hot on the heels of Walkathon. Helen and the kids did a fantastic job in choosing who they were dressing up as, and in their costumes. Personally, I don't know how they all didn't get awards. No doubt that is my bias. But Jess won the award for her class, which was great. 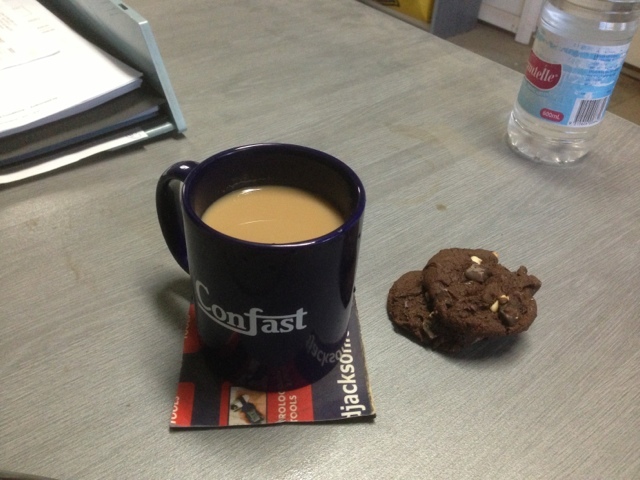 Ian brought a surprise with him to work this morning - Mackenzie has been baking, and her choclate muffins were indeed a treat with the morning cup of coffee. 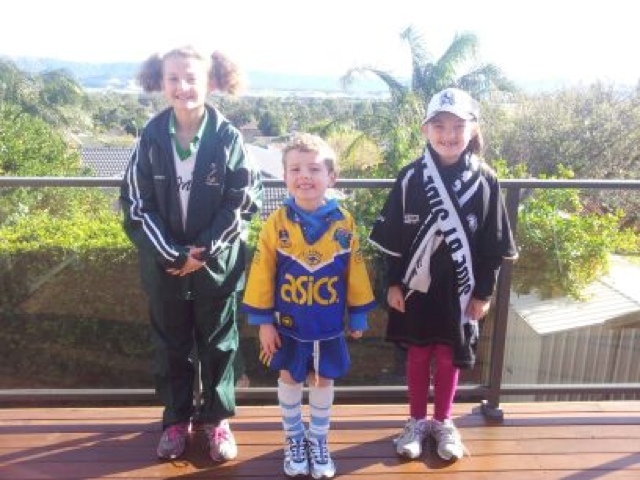 The kids had their Walkathon on at school today, and they were asked to wear sports gear or favourite team colours to make it a fun day. 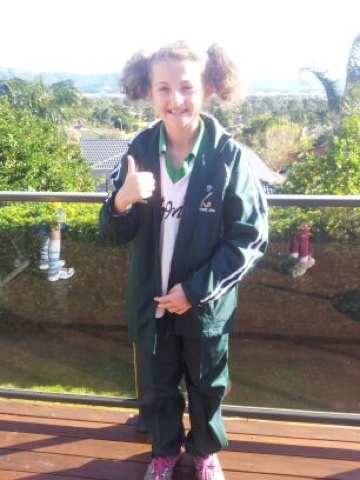 Jessie went in her Albion Park hockey gear. 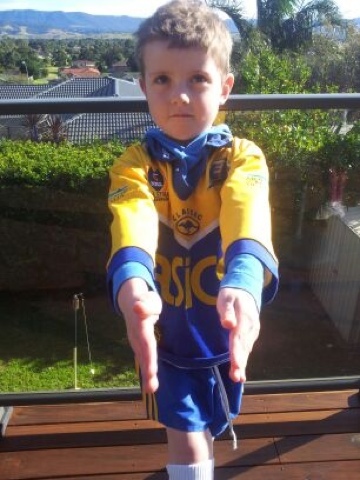 Josh went in his Parramatta Eels gear. 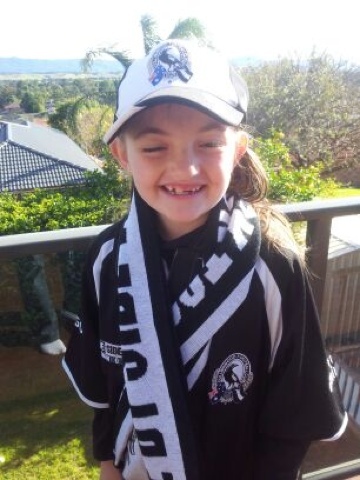 Maddi went in my Collingwood Magpies gear. Open you eyes Maddi!!! Rosehill today. At the start of the day I was less confident of going as well as last week. Here's how it all turned out. Race 1: 3. Champagne Cath. Fixed Odds $2.30. Bet $2. Result: never in the race, looked to pull up lame. Race 2: 5. Lunayir. Fixed Odds $7.00 & $2.25. Bet $2 on place. Result: photo for third place. Race 3: 5. Aliyana. Fixed Odds $7.50 & $2.35. Bet $2 on place. Race 4: 1. Burbero. Fixed Odds. $4.20. Bet $2. Result: was buffeted in the straight and finished midfield. Race 5: 2. Catkins. Fixed Odds $3.50. Bet $2. Run down on the line by Velrosso to finish 2nd. Result: vetted at start and a late scratching. For f*#ks sake!!! We all went to Shellharbour Workers this evening to watch Jessie being a part of the Albion Park Public School choir in this year's Southern Illawarra Music Festival. We went for dinner in the bistro beforehand with the Young's and the Jukes', which was interesting with so many crazy kids running around the Club being crazy. The kids in the choir were very good - from all schools. But given that we left home at 5.00pm, the kids went into the hall for the choir at 6.50pm, the show started at 7.30pm, it didn't finish until just after 9.30pm and we didn;t get home until 10.00pm meant that we were going to have some very grumpy and grouchy and tired kids the next day. The Betting Experiment. What Can I Do With Twenty Bucks? So I thought I'd conduct a little experiment over the next couple of weeks, and then expand it if it works, and can it if it doesn't. I'm starting with $20. I'm going to have a bet in each race in Sydney every Saturday, unless a race just has too many options for winning, in which case I will miss that race. I will also have a quaddie each weekend. However, the maximum I will spend on one race will be $2. By doing this, I will see if I can make any money without actually losing hundreds of dollars if it doesn't come off. I am also going to avoid the big bets to chase money already lost, and see if I can maintain a cunning kit by doing so. This may not last long, but I will see how I go. So today I have outlaid my $20 into my account, though I have only spent $16 of it. Race 2: 2. Lucripetous. Fixed Odds $2.40. Bet $2. Race 3: 2. Follonica. Fixed Odds $6.50. Tipped by Brendan Moore. Bet $2. Result: led at the turn but overrun for 5th. Race 4: 6. Field Marshall. Fixed Odds $3.80. Tipped by Mark Burns. Bet $2. Race 5: 3. Mic Mac. Fixed Odds $6.50. Bet $2. Result: finished six lengths behind the $1.30 favorite Rain Affair. Race 6: No bet. Coudn't choose between Eurozone, Watabout and Bull Point. Result: Eurozone by just over a length. Race 7: 10. Let's Be A Star. Fixed Odds $10.00 & $2.90. Tipped by Kevin Moon. Bet $1 each way. Result: mid field, never in it. Race 8: 10. Reunite. Fixed Odds $12.00 & $3.50. Bet $2 on place. Result: Good run for 3rd. Quaddie: $2 for 8% of total dividend. Result: got first two legs, Prince Cheri flew home late for 3rd in the 7th. Eigelstein 2nd and Reunite 3rd in 8th. Account at end of day : $26.95. With Helen having scurried away to Berry for the weekend with all of her "playgroup mums" cronies, it was left to me to once again look after the kids for the weekend. We all took Jess to hockey in the morning for her usual Saturday game to start with. Then, with Josh having received four free tickets to go to the GWS Giants game, we along with Dad headed back to Sydney for the day. The Giants were playing Melbourne, who were having a tough old season, but had won two games during the year, including the first round match against the Giants after the Giants had led by 17 points at three-quarter time. The Giants had yet to win a game in 2013, though they had been all square with Geelong with a quarter to go, had very nearly beaten the Western Bulldogs in Canberra a couple of weeks earlier, and had scared the life out of Collingwood last weekend. Could this be their day?! Josh of course had been before, but it was the girls' first AFL match, and they had a great time. I'm not sure if they expected that their father would get as... loud... as he did in his support during the day, but when you had some rowdy Melbourne supporters pushing their team on, someone had to stand up for the Giants and give a little bit back, and so that was me. In the end, the Giants prevailed, to the rousing cheers of the home crowd. Of course, all three kids have learned the words to the Giants victory song, and sang it long and loud with the rest of the crowd. It was great to see the gusto and passion that the players sang the song back in the change rooms as well. Great to see. There is now a very big chance we will get family membership for next season, seeing as everyone enjoyed themselves so much. What do you call a world-class Australian cricketer? What do you call an Australian who can hold a catch? Why can no-one drink wine in Australia at the moment? They haven't got any openers . What is the difference between Cinderella and the Aussies? Cinderella knew when to leave the ball. What does an Australian batsman who is playing in The Ashes have in common with Michael Jackson? They both wore gloves for no apparent reason. Who spends the most time on the crease of anyone on the Australian cricket team? The woman who irons their cricket whites. What's the height of optimism? An Aussie batsman putting on sunscreen. What do you call a cricket field full of Australians ? What's the difference between an Aussie batsman and a Formula 1 car? What's the difference between Michael Clarke and a funeral director? The Australian bobsleigh team have asked the Aussie cricket team for a meeting. They want to ask their advice about going downhill so fast! What do you call an Aussie with a bottle of Champagne?